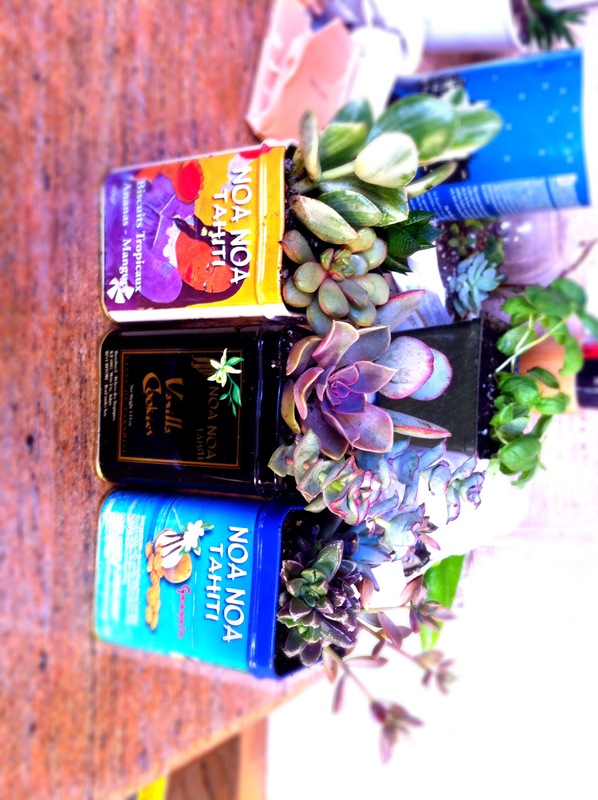 Free leftover tins from Bora Bora become planters. A nice memory, long after the cookies and the tan have been gone! In September 2010, I was lucky enough to visit French Polynesia. I stayed on the islands of Tahiti and Bora Bora. The fanciful cuisine of the former — particularly the long-standing food truck tradition — was certainly a favorite memory. But it was only off the shores of Bora Bora that I got to scuba dive. And I do love nothing more than being underwater. Whilst immersed in the almost too perfect turquoise seas, I swam with pregnant manta rays and big fat lemon sharks. Gifts from the gods, to be sure. I hadn’t completely forgotten about the dives, but almost two years later, they were far from my mind. And then, about a month ago, I got a message from an old dive buddy — a Frenchman who lives near Avignon. And then it all came back. A screen shot of me after the dive, from "Les reines du lagon." It so happens that a French film crew was on my dive boat that September, and they were making a documentary about the manta rays in the motu. They filmed the briefing, the dive and then interviewed me afterward. Miracle of miracles, I made the final cut. The film, “Les reines du lagon” (The queens of the lagoon”) is by Dominique Martial. Mon ami francais sent me a screen shot and some video clips. Apparently, I sound way more sophisticated in French! The parts I saw were magical. Hope I get to see the whole documentary one day. I had saved some cookie tins from the resort in Bora Bora where we stayed while diving. They were the tastiest tropical butter cookies I’ve ever had! I poked drainage holes in the bottom of the tins, filled them with soil and then planted a trio of succulents in each. Now, whenever i water them, I will be thinking of Bora Bora and my magical moment with mantas, en francais! This entry was posted in Garden, Nature, Plants, The Sea, Travel and tagged Bora Bora, Dominique Martial, French Polynesia, garden, Les reines du lagon, manta rays, motu.